We had the opportunity to visit Waterton Lakes National Park this summer when friends invited us to camp with them over the July long weekend. It was our first visit to this amazing place as a family and I wasn't entirely sure what we would find to do that was child-friendly. 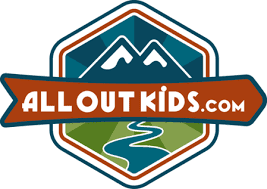 In the past we always visited Waterton to scramble the local mountains and hike spectacular trails that are way beyond the ability of most children. 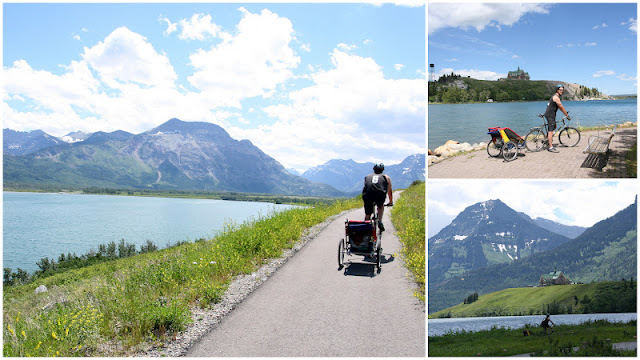 Was I ever blown away when I started doing some research by how family-friendly Waterton Lakes National Park really is! Below is the run down for those planning on visiting this summer or in the future. If it isn't on your agenda, a visit to Waterton with your children should go on the bucket list for sure. Waterton Lakes National Park is located 271km South West of Calgary and 80km North of St. Mary, Montana. That means it is accessible for Canadians and Americans alike. Waterton was Canada's fourth National Park and is the smallest in the Canadian Rockies at only 505 square kilometres. Waterton is also part of the Waterton-Glacier International Peace Park, created as a symbol of peace and good will between Canada and the United States. We always camp at Waterton Springs Campground which is located 3 km north of the park gate entrance. There's a town campsite but you are camped on a big open field without much in the way of privacy, trees, or nature. Waterton Springs is a private campground and with that comes showers and laundry facilities. Other than that, it's nothing fancy; there's one simple playground with swings and a couple slides. You will find some private sites though that are well spaced out and sheltered from the Waterton winds. There's also a very large tenting area with trees bordering each site. Most of the electric sites are much less private but apparently from what I've gathered from most RV parks, crowding trailers together into an open field is normal and par for the course. The best thing about this campground is the Waterton Springs Interpretive Trail. Both the trail and campground were purchased by the Nature Conservancy of Canada in 2007. The loop trail is very short and simple at 1km but the views are unsurpassed in Waterton for such little effort. This is a pretty awesome place to camp! For more information on camping in Waterton, visit the Parks Canada Website. Below is a list of short loops and trails that are perfect for families with toddlers and preschoolers. If I had to pick my top three, I'd choose Red Rock Canyon and Blakiston Falls, the Townsite Loop Trail, and the Waterton Springs Interpretive Trail. The canyon truly is a unique place for kids of all ages to explore and you can get right down inside the small canyon to play in the creek flowing through the red rock. The trail to the falls is a beautiful shady walk through an enchanting forest of unique flowers such as Bear's Grass. The Townsite Loop Trail follows Upper Waterton Lake around the edge of town, passing by the boat marina and many rocky beach areas where you can throw rocks in the water or just enjoy the views out towards the Prince of Whales Hotel. Finally, the Waterton Springs Trail showcases the gorgeous prairie surrounding Waterton Lakes National Park. It is an explosion of colour in July when the Brown Eyed Susans are in bloom. If your children are older or you are carrying smaller kids and can go further than 3km, Waterton has some amazing trails not to miss while in the park. Our favourite view of Upper Waterton Lake is seen from the Bears Hump. This hike starts from the Visitor Centre and is only 2.8km return. Be warned though that there's 200m of height gain and the trail is quite steep. (Read - straight up!) 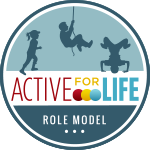 Some preschoolers will be able to handle the challenge and most school-aged kids would have no problems at all. From the top of the Bears Hump you will feel as if you are on top of the world as you stare down on the Canadian Rockies' largest lake. If you are going to do this hike arrive at the parking lot early! It fills up quickly in the day and the trail also bakes in the mid-day sun. In all my visits to Waterton, this was my first time on this hike. If you are hiking with teenagers, the two best trails in the park hands down are Crypt Lake (17.2 km return and 700m gain with boat shuttle required) and the Alderson Carthew Traverse from Cameron Lake to the Waterton Townsite (18km and 650m of height gain with car shuttle required). 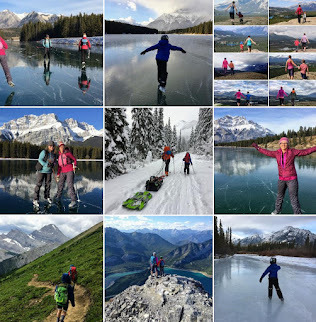 The Crypt Lake trail is one of the most famous hikes in the Canadian Rockies for good reason! There's a scenic boat ride to reach the trail head, waterfalls, a cave that you crawl through, some mild scrambling along a cliff band holding on to a cable, and finally a beautiful lake at the end. Just don't miss your return boat ride back to town! Another great website along with the Parks Canada one I've been linking to, is the Experience Glacier-Waterton site. It has a lot of detailed hiking information. The Kootenai Brown Trail was opened in 2010 and was the highlight of our recent trip to Waterton! It's a 7km paved bike trail that runs from the Park Gate to the Visitor Centre. 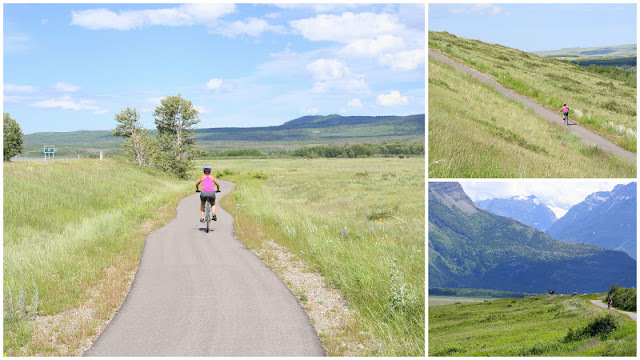 Continue on the sidewalk down into the Waterton Townsite, do the Townsite Loop Trail, and ride back to the start for a total distance of approximately 18km, give or take a kilometre. It was our salvation with a sick child who needed some down time. We put him in his Chariot and towed him into town. We also loved the exercise that we got. I've driven the highway into town many times and never fully appreciated the scenery like I did this time. My mouth was wide open the whole time in awe at the beauty around me. Although this is a paved trail, there are some steep hills. As a beginner cyclist, I found I had to walk a few of them. Meanwhile my husband never had to stop even once while pulling the heavy Chariot so it's all relative I guess. Not your average bike ride. Me and my new bike - LOVE biking! Drive the scenic Akamina Parkway to Cameron Lake. While you are there, rent a canoe and go for a short paddle or walk along the lake-shore trail. Walk around the town of Waterton and grab an ice-cream cone, rent a bicycle from Pat's, or tour through some of the souvenir shops. We had a lot of fun on our trip to Waterton and hope to make it an annual adventure. 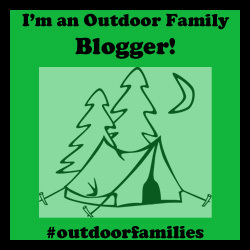 I'd love to hear your favourite things to do in Waterton with your family. Awesome photographs..Great post.I am going to Waterton Lakes National Park next week.Can't wait to go there. We are from NS and coming to AB this summer. I just googled Waterton and Kids and came up with your site. THANK YOU. This is amazing. I do a lot of travel blogging for the East Coast, and I want to use you as a great resource and model. THANK YOU! I am saving this site! Thanks so much. Glad it was helpful.